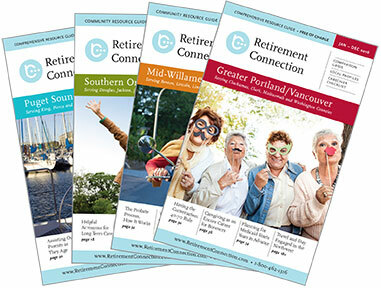 The Mid-Willamette Valley Edition of Retirement Connection is hot off the press and we have been busy delivering guides. All of our sponsors should have received one full box of the new guides. In addition, all hospitals, libraries, area agencies on aging, senior centers, and meals on wheels locations should be stocked up. Please let us know if you are in need of any additional guides, they're free! Make sure you put a label on the front cover with your logo saying "Compliments of" when you hand them out. We are excited to be the official Resource for Salem Health, and now also Legacy Medical Centers. With this new edition wrapping up, it is time to celebrate! We will NOT be having a SSN meeting this month, so make sure to attend the Release Party. With over 150 guests expected, this is the biggest networking event of the year that you won't want to miss! This is an open event and all are welcome to attend so please feel free to invite referral sources and other guests. We are hoping that a surprise guest feels strong enough to join us for the big night- fingers crossed! This summer I took 30 days to focus on gratitude. I found that verbalizing at least one thing that I was thankful for each day made me realize how abundant my life really is. Even as my best friend went onto hospice, I have been grateful for every extra day we have together. These past few months have changed me forever- for the better. Be grateful for at least one thing every day!